Moving on to another collection that is already heading out Sally's Beauty Supply doors (but is still on etailers lists) is the Crackle Glaze by China Glaze. 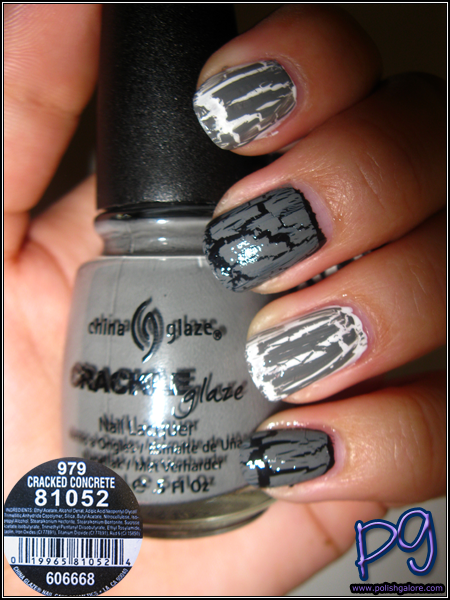 This is the first set of crackles - not the metallics (but I have those too). I've already reviewed some, but now I'm finishing them up. First today is Cracked Concrete, a slate grey. I painted my nails first with CND Blackjack and OPI Alpine Snow. 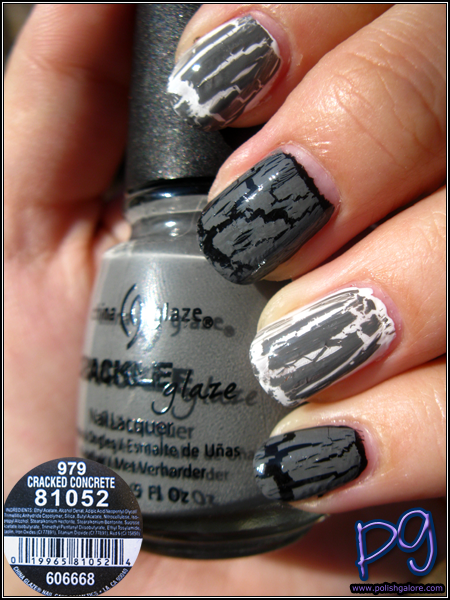 I added a top coat of Seche Vite and let it dry BEFORE adding Cracked Concrete. 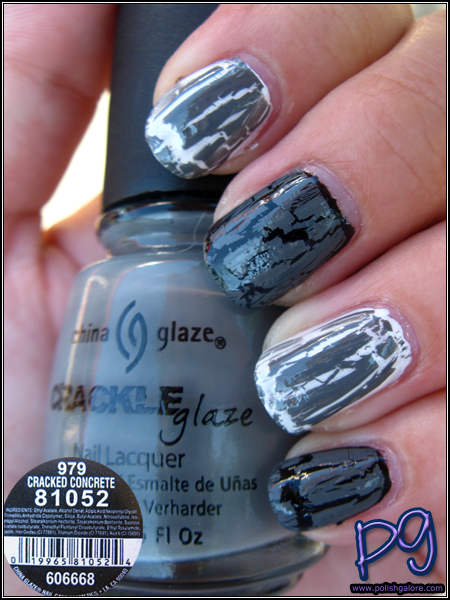 Some people find it easier to use a crackle/shatter coat on wet (or slightly wet) polish, but I find it better over dry. As you can see, it crackled nicely! I used a thin coat that covered the entire nail in 3 swipes and this is what I came out with. It's a lot like China Glaze Recycle for its base color. 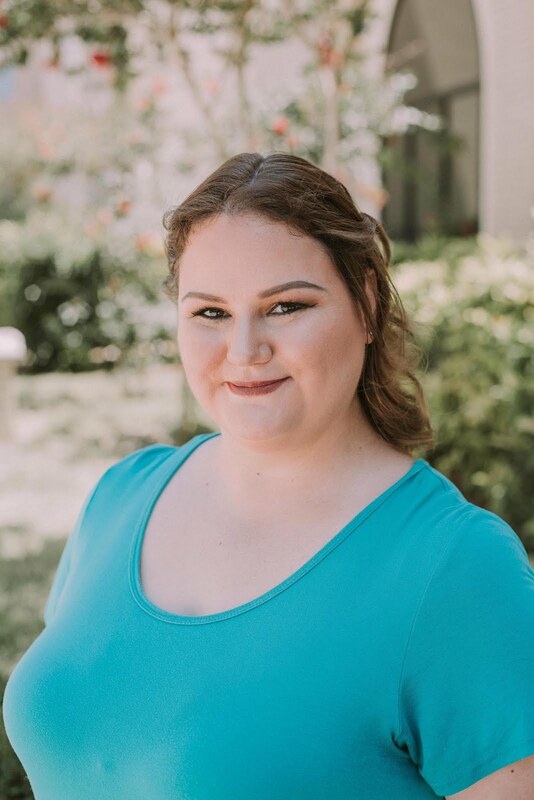 No yellow tones (yay!) and no red tones (yay again!) but just a nice grey. Indoors with the flash - not much else to say here. :] If you're into grey cremes, I'd say get it! 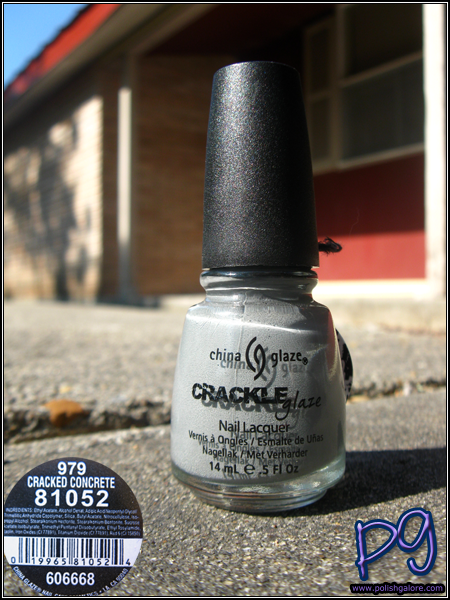 China Glaze can be found online through several etailers, including my favorite Head2Toe Beauty, Sally's Beauty Supply, and TransDesign. LOVE this! I've been thinking about getting this but now I know that I must! I love how it looks over the black and the white! Definitely on my most wanted list now. Nicole by OPI Redy to Runaway Love?